Biography & Genealogy: Robert Henry Cousins, Class of 1867: New Market Cadet; Private, Co. A. 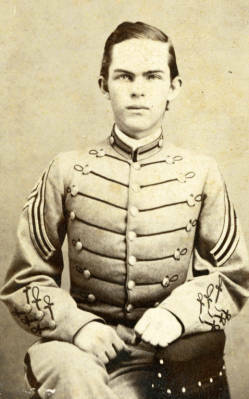 Served with the Corps of Cadets in the trenches at Richmond, Va. until the Corps disbanded in April, 1865. Genealogy: Born- November 24, 1847 (grave marker says 1848). Father- Alexander Winfield Cousins; Mother- Martha F. Newbill. Pat. Grandparents- unknown. Mat. Grandfather- Henry Newbill; Mat. Grandmother- Jane Crenshaw Moore. Married- Julia Weber Wooldridge. Children- 1st: Robert Winfield; 2nd: Julia Stone; 3rd: Albert Sidney Cousins. Careers: Assistant Professor of Math at VMI, 1867-69.; Civil Engineer; Railroader. Died- Mar 3, 1932, Austin, Texas. Buried Oakwood Cemetery, Austin. Others buried in family plot: Cousins, Julia W. Mar 13, 1852 - Jan 12, 1916. Cousins, Albert S. Aug 18, 1884 - Aug 17, 1907.